The recently published biography by Markar Melkonian, My Brother's Road: An American's Fateful Journey to Armenia, begins with an interesting premise—what kind of a man was the subject of the book and the author's brother, Monte "Avo" Melkonian? As its subtitle suggests, the book attempts to answer the question by tracing the life of an ordinary kid who grew up to become a freedom fighter in Armenia. Monte's life led him from his birthplace—the quiet, unassuming farming village of Visalia, California, "the Walnut Capital of the World"—to the ranks of the Armenian Secret Army for the Liberation of Armenia, and on to heroics and a legendary reputation in the battle for Mountainous Karabagh. Along the way, we learn about Monte's prowess as a little league baseball pitcher. We discover his first encounters with "otherness" in the schoolyard, when American schoolchildren ask him where he is born. We learn about his interest in Armenian history and, eventually, the "Armenian Question." We also read about occasionally amusing encounters, such as the one between Monte and a childhood teacher who recognizes him unexpectedly on an airplane, just as he is preparing to assassinate a Turkish official. Melkonian's book tries to walk the fine line between telling a good story and deriving a larger meaning from a series of interesting events. In essence, the book asks the opposite question posed by a novel Ara Oshagan and I discussed several weeks ago, Micheline Aharonian Marcom's The Daydreaming Boy. Marcom asks how—or whether—it is possible to understand a historical event like the Genocide from within the fictional form of the novel. Melkonian seems to ask instead whether it is possible to tell the fantastic exploits of a man become legend from within the non-fictional form of biography. The book's Prologue seems to address just this dilemma, as the author recounts the day of his brother's burial at the young age of thirty-five. As thousands of mourners gather around the coffin as it winds its way through the streets of Yerevan, the author tells us that "a Russian general told a television interviewer, quite inaccurately, that they had first met when Monte had been a slayer of Soviets in Afghanistan. A one-legged woman claimed that Monte had rescued her from a minefield. The child of a peasant recalled his 'amazing simplicity.' And yet so much remained uncertain, obscure." The characters Melkonian singles out could just as easily populate a mystery novel or a book of fables. In the book's final chapter, Melkonian returns to this burial scene, after recounting his brother's death by shrapnel in a roadside confrontation. But now, Melkonian says simply that "the rumors and conspiracy theories continue to proliferate. But for my part, I'm convinced that Monte and Saribeg [a fellow soldier] died in a chance encounter with Azeri fighters." This seems to echo the author's earlier claim in the Prologue–that "as the rumors have proliferated over the years, my need to separate fable from creditable report has only grown." The statement is entirely fair and pragmatic. But it comes on the heels of a series of other puzzling questions about Monte—"Was he temperate or was he a vodka guzzler? A communist to his dying day, or a reborn nationalist? A defender of captives or a slitter of throats? "—puzzling more for being posed at all than for their insight or interpretive value. Unfortunately for the book and its readers, this apparent discord between the marvelous and the mundane is never resolved or properly addressed. As such, the questions Melkonian poses and attempts to answer ultimately hold little enduring philosophical or historical value. The reviews on the book's cover uniformly depict an author with a curious, intellectual interest in his material. That may very well be true. The careful reader will also suspect, however, that the author is ultimately less interested in the apparent dilemma of Monte Melkonian's life than in telling the story of his 'kid brother' turned folk hero. The result is a book that too often comes off as trite more than philosophical, sentimental more than serious. The book's real value is in telling a good story, which it does well, and its genuine warmth and honesty. There are also moments of some lyrical beauty, ironically often in descriptions of battle and warfare. In chapter eight, for instance, the author powerfully evokes a scene of war from Monte's time in Lebanon: "Israeli tanks squealed over the hills in the medium distance and Israeli helicopters hovered low overhead, dropping phosphor flares that threw flickering blue shadows over the boulders and brush around Monte's earthen bunker." Just a few lines later, however, Melkonian reverts to his more usual 'personal' narrative voice to describe his little brother: "putting his math skills together with his military training, he radioed enemy coordinates to Palestinian rocket launchers...." The nuanced description of battle quickly gives way to what sounds like a line from a hastily prepared resume. Later in the book, Melkonian muses about his brother, who is spent time in Italy: "he strolled to a park near the Coliseum, absorbed in thoughts about architecture and the morals of various nations." The book ultimately—and quite explicitly—poses its own dilemma of the personality that lies behind a myth, the 'truth' concealed within fiction. When a French journalist interviews Monte, the author suggests that she "had been surprised to discover that the fearsome terrorist leader was in fact attentive, funny, and smart—a far cry from the bellicose fanatic she had expected." The line encapsulates the book's interest in the 'human' side of Monte Melkonian's story well. But it suggests equally that the implicit emphasis on the personal story is the book's real undoing. In My Brother's Road, any ambitions of exploring the paradox of personality are finally resolved in the private conversation between a man and his brother—and more generally, two Armenians in communion with each other. It is perhaps not too far-fetched to suggest that the pervasiveness of this too comfortable paradigm of community is precisely the obstacle that diasporan Armenian writing must overcome on its way to something greater. Hovig Tchalian holds a PhD in English literature from UCLA. You can reach him or any of the other contributors to Critics' Forum at criticsforum@sbcglobal.net. What do you mean by "a career similar to Monte's"? Does that mean US Military service? I am in general agreement with Aaron. I feel this book is a powerful document and can be used as a powerful tool to inspire youth to take more ownership of their homeland. This is a very inspirational book and that's because Monte's life and actions were very inpsirational. As far as waiting for a certain type of leadership to emerge...that really doesn't make much sense to me...I feel my connection is more to the land and people and culture than to the political system. Which is why I plan on moving there. If it has problems, I need to work to make them better--not wait for other people to do it for me. It's just that I don't know where this is headed, what is the big picture? Sending money to armenia until a wester type leader emerges is in the minds of all of us ..... basically because of poor leadership in Armenia! What if that leader never emerges? Monte didn't wait for a leader to emerge! Maybe it should emerge from the diaspora? maybe one of us (generally speaking) could do that job someday! I don't feel that we suffer due to poor leadership. We have bad characteristics that are common to a great number of our people, that is to say we have a lot of bad traits, and our leadership simply reflect us. We have all sorts of leaders, good ones, bad ones, mediocre ones...they are reflections of us. If the bad ones are really bad, its because we are a people of extremes. Our immoral, "bad" individuals are horrible, and a lot of times our good individuals are excellent. We have people like Monte, Vazgen Sargsyan, Victor Hambartsumyan etc. and then we have people like the many traitors that contributed to thousands of deaths during the genocide, villagers that gave away the locations of fedayees, people like the killers of Oct. 27. Perhaps I haven't been succesful in fully expressing my ideas on this, but to sum it up: We don't suffer due to poor leadership, our leaders are a reflection of us. If they are selfish and incompetent its because we are selfish and incompetent. If they are hardworking and altruistic, it is because we are hardworking and altruistic. When we speak of our community and we throw in the word they...we begin to go off on a track that can not lead to improvement (read as self-improvement). We--not they. Finally, I disagree with most of Dr. Tchalian's review of the book. I think his main flaw is that he looks at it from literary critics point of view. This can be argued also. However, I think the book's real importance is in the real world application of it. Use this book to inspire the next generation as well as the current one (if there is such a thing as a current generation). And as far as his critical review goes, I'd argue against his position in that respect also. I don't mean to offend anyone, this is just how I speak/write. 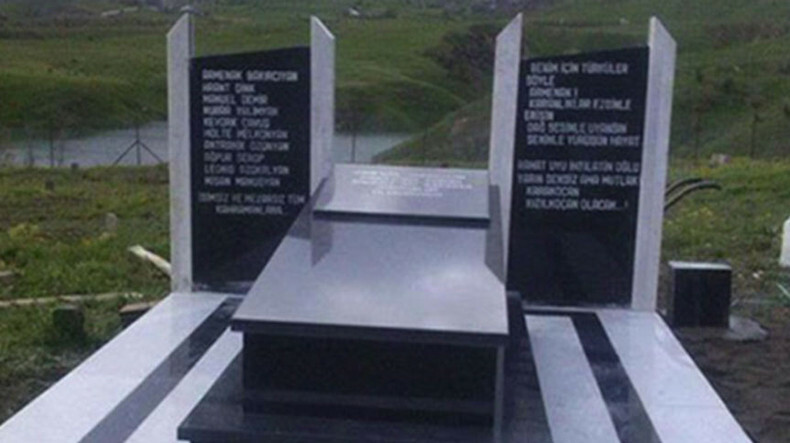 The Provincial Hall of Tunceli province in Turkey has made a decision to demolish the memorial dedicated to Armenian national hero Monte Melkonyan and other heroes of the Armenian liberation war. The monument was opened in one of the villages of the province. Referring to the Turkish newspaper Sozcu, Ermenihaber reports that the decision of dismantling the memorial was made after the event had been covered by Sozcu newspaper columnist Sayg Ozturk. His article presented the response of Ali Erdinç Chairman of the Talaat Pasha Committee, a Turkish nationalist organization aiming to counter recognition of the Armenian Genocide, regarding the fact of unveiling the memorial. In Erdinç’s words, Turkey is being weakened within with the assistance of the Armenian Diaspora. Along with Monte Melkonyan, names of Gevorg Chaush, Armenak Bakrjyan, Manuel Demir, Nubar Yanikyan, Andranik Ozanyan are also written on the memorial. “We condemn the Armenian Genocide. We pay tribute to memory of Armenak Bakrjyan and Hrant Dink. The Armenian Genocide continues even 100 years later,” the inscription on the memorial reads. Monte has done well for us, for Armenia, he satisfied his need to do for Armenia. We can be very proud of him, truly a hero. God love him, we love him. Մեր զրույցի վերջում Սեդա Մելքոնյանը մի պատմություն է հիշում. i was always told Monte was taking cover behind the wall, that cement black was hit my the tank shelling. and the fragments hit him.